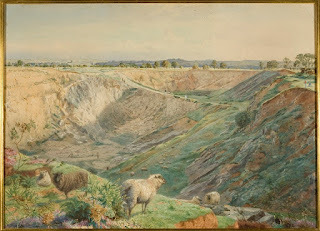 Attributed to William Arnee Frank (1808-1897), Quarry on Durdham Down was painted in watercolour and bodycolour circa 1865. This is an unusual subject for an artist and shows the extent of quarrying on the Downs in the 18th and 19th centuries. The quarry was filled-in by 1869 and there is no trace of it today. We are looking towards Clifton from the near Stoke Road. The tower of Dundry Church is on the left skyline, with the Clifton Observatory and a pier of the Suspension Bridge just below it, to the right. The artist was from a Bristol Quaker family; his early work was in pencil and he seems to have become more proficient in watercolour in middle age. This painting was purchased with the assistance of The Friends of Bristol Art Gallery in 2010.